Motivated Seller! 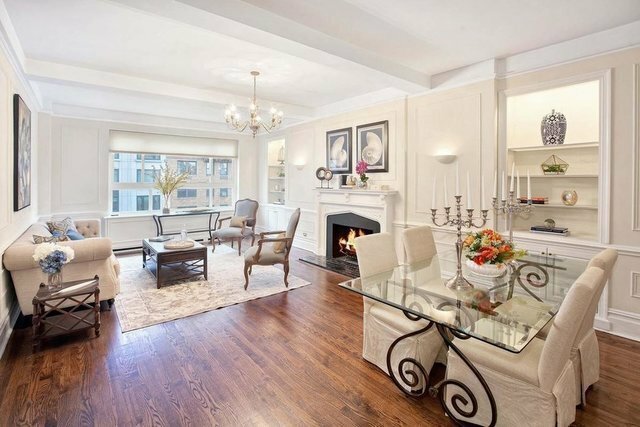 Classic prewar charm is beautifully reflected in this spacious two bedroom, two full bath corner residence located in an Upper East Side cooperative. A distinctive open entry gallery with generous wall space for artwork and room for furnishings welcomes you into gracious living accommodations complemented by high beamed 9.6 ft. ceilings, rich wood floors and other lovely details. Oversized windows facing east, west and south invite abundant natural light into the home and showcase open city vistas. The stunning sunken living room complemented by tasteful millwork, custom built-in shelving, a wood-burning fireplace and a dining area is a superb setting for relaxing and entertaining. The adjacent renovated windowed eat-in kitchen is thoughtfully designed for the chef with plentiful custom cabinetry (many with glass door fronts), extensive Calcutta Gold marble countertops, a tiled backsplash and Viking stove, oven and dishwasher. Two very large sun-bathed master bedrooms offer open city views as well as en-suite windowed baths. The master bedroom features a custom walk-in closet and a renovated master bath. An additional walk-in closet sits off the entry gallery, enhancing the ample storage space. Plus, you'll enjoy the convenience of having your own washer and dryer in the apartment, and your own private storage cage!.Built in 1929 and converted to coop in 1967, the handsome 180 East 79th Street is a sought-after full-service luxury residence on a tree-lined Upper East Side block between Third and Lexington Avenues. The building has 24-hour doorman service, elevator attendants, gym, laundry facility, bike room and storage. The excellent address is near world-class dining, shopping, museums, transportation, and wonderful Central Park. Pets and Pied-a-terres allowed. Up to 50% financing permitted.